“We’re working on Linux support—hang tight!” said Google nearly three years ago. And despite that claim and more repeated promises over those many years, Google Drive for Linux still hasn’t been released. If you started hanging tight when Google asked you to, your arm is probably very, very sore. But there’s now some actual evidence Google may be on the brink of releasing Google Drive for Linux, in the form of screenshots showing Drive running on Ubuntu. These didn’t just appear on some social media site where they could have been faked. No, they leaked straight from Google itself. They’re named setup_taskbar_lin.png and setup_drive_folder_lin.png. The Mac installer also includes both Windows and Mac versions of the screenshots, which are shown during Google Drive's first-time setup wizard. They first appeared in version 1.18.7821.2489 of Google Drive for Mac, released in October 30, 2014. This suggests that development is actually proceeding on Google Drive for Linux, and that Google has an internal build of the software that they’re working on. As Google themselves use Linux internally—in fact, they have their own Ubuntu-based Linux distribution known as “Goobuntu”—it’s unsurprising they’d want their own software to run on their own computers. 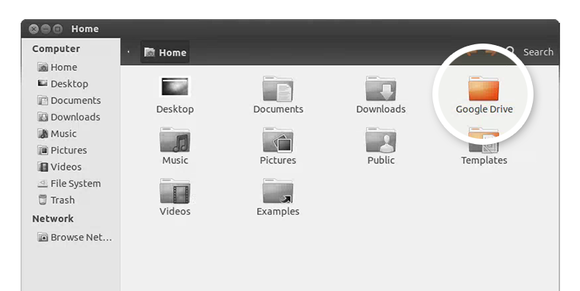 But, if you’re impatient, there are ways to use Google Drive on Linux today. There’s a command-line tool named “drive” which allows you to push or pull files from your Google Drive account via the command line. It was developed by Google employee Burcu Dogan when she worked on the Google Drive team, so it’s probably as close to an official tool as you can get. But most people won’t be happy with this solution, which doesn’t offer the automatic background sync and easy graphical interface most of us want. Grive and the accompanying Grive-Tools package are probably the slickest, easiest-to-use free option for most people. Give this is a try if you use Ubuntu! There’s also Insync, a third-party Google Drive client that requires you pay a fee to use it. For a one-time $15 fee for every Google account you want to use it with, you get a fairly polished Google Drive client for Linux as well as Windows and Mac versions of Insync. This tool does at least add more features that the official Google Drive client doesn’t offer, such as the ability to sync with multiple Google accounts, so some people may find it useful even after there’s an official version of Google Drive for Linux. You could also just give up on Google Drive, as the many Linux users who were “hanging tight” did long ago. For all its controversies, Dropbox has officially supported Linux with a slick graphical application for many, many years. Some other services—like the encrypted SpiderOak cloud storage service—also support Linux. There are cloud storage providers that will actually support your desktop of choice, and you might want to just give them your business.